For this 4th article, I’m coming back on an important step for Lyncelia: The very first concert of this project on 31st March 2009. It was the starting point of the Lyncelia concerts and it proves me that even il I’m alone I could perform on stage and take pleasure to play. For the first time I played songs with lyrics I had written that I sung with a different voice from my principle band at this time. The experience was intense and it was with a huge apprehension that I step on the stage this night to play the 6 songs that were finalised. At this time, the drum sound was not the same (I haven’t the TR505 for the 3 albums) and there were not “Diamonds” nor “Persistence of Vision” (the text wasn’t finished). This day, I took my amplifier but the producer of the show refused that I use it, he plugged me in the mixing desk and from this day I abandon the amp and use only the amp simulator of my multi-effects. With this I could play everywhere with the same sound and it makes easy the soundchecks before the shows. For the history, at this time Lyncelia was at the beginning and was just a solo side-project from my principle band. My songs had started to buzz on myspace and I received a message from the singer of Soul Disorder (that was a great coldwave solo band) who was searching for a 2nd band to play à La Cantada (Paris – fr). I accepted the deal even if I wasn’t sure of the result to play alone. I work my sound to be able to play a show and this night on 31st March 2009 I play my very first Lyncelia show. I had great memories cause it was the very first time I played solo with a project I have in my heart. For this third retrospective post, I choose to talk about the 2nd album “Assigned, for Disillusion” realeased just 5 years ago on 11th March 2013. This album contains songs I still have pleasure to play, some are still in my concert setlist (“Linxya”, “Unveiled Illusion”, “Blondestar”…). 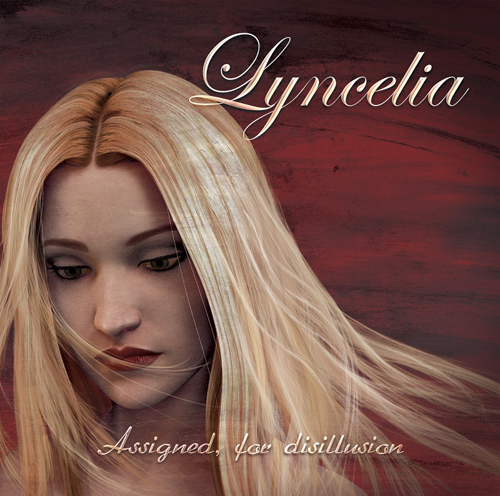 It was an important step for Lyncelia cause this album marked the fact that we are not a band of one album et that we had the capacities to keep en and give a successor to “Lovelorn”. It was an evolution on the sound by the add of Claudia on bass, and a big evolution on my voice. This disc brought to us respect of Gothic people in France and worldwide. Lyncelia was built to last. I’m coming back on the making of this album that was spawned in painful conditions, it was written and recorded in a bad and black period of my life. I was going through a great period of doubt and disillusion, all seemed lost, I was empty and dryed out. From the melancholy of “Lovelorn” I came to despair. I put all I had at this moment, I came to the end of things until I lost inspiration, envy and will. I let many things of me and it was a catharsis that crystallized all my sickness and allow me to express it from my subconscient. Once “Assigned” was finished and realeased, I feel much better like all my sickness was exorcised. This disc represented many years of pain and suffering I accepted and I let it behind me. I was lighter and I could find inspiration to write “Forsaken Innocence”. I couldn’t finish this post without talking about the artwork made by Sandra (she left us after a long sickness). She made a great artwork traducting with perfection the topics and the ambiance of the album. When she send me the almost finished version (I remember to open this mail a morning just before to work), I was blown away by the results of her hard work. This so sweet young girl with a glance lost in disarray and despair… Still today I thrill and I have much pleasure to look at it. On this month of February for this 2nd article of this Lyncelia retrospective, I choose to enlighten the song “Lovelorn” from the first album. This song is based on the myth of Orpheus. After losing his beloved Eurydice, Orpheus will dare and defy death to get back to her. Once he completed this quest he should guide her through the kingdom of shadows without looking back on her. Doubting he looked back, he saw his beloved behind him but she was taken and Orpheus lost his love for the second time and for eternity. The lyrics is one of the very first I wrote for Lyncelia and put the start of my writing, some independent sentences, very imaged and marked on the description of sensations. It forms a text that enlighten strong ideas and strong sentences. The topic is one of my favourite, the search of the lost love. This song (written in July 2008) is special in Lyncelia discography cause there is no guitar parts, all was played on bass. Of course there is two distinct parts that represents my trademark with a rythm part and a melodic part. The drums features TR909-like sounds with lots of Reverb and Flanger effect on it to get a sound in the style of “Faith” from The Cure that was, at this time, an essential influence in the conception of the Lyncelia sound. This 2018 year celebrate the 10 years of Lyncelia. To celebrate this decade of music and passion, I open a new topic category where I will tell you some important moments, songs, pictures, videos or whatever else that make the history and life of Lyncelia and allowed this project to go further. In september I will release a compilation of the three albums and I will add some covers and demos of songs from my personal archives. So, I open this celebration with the song “Assigna” from the album “Lovelorn” (2010). This song is part of the few songs I wrote just before the creation of Lyncelia. “Assigna” allowed me to find and tune the “Lyncelia style” and find my way in ColdWave/Gothic music and told me that this music is a real part of me. This song allowed me to find that Lyncelia is not just music but a way to express what I feel deep inside and is also a sort of spiritual and personal development that marks what I live and give me strength every day.